4. 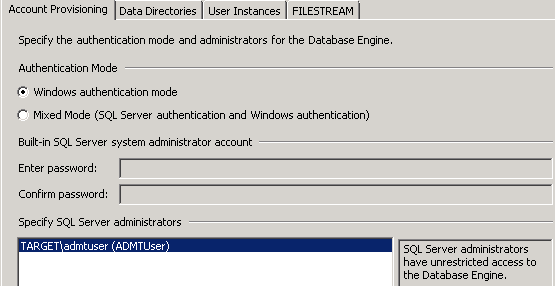 Set an account for the SQL service to run under (use your ADMT Service Account). 5. Set a SQL administrator, choose the user account you plan to run ADMT under- be aware that this user account will need to have local administrative rights in the source domain (this will be discussed further in the series). For this series I will be using ADMT 3.2, which is the supported version for Server 2008 R2. Use ADMT 3.1 for installation on a Server 2008 non-R2 server, or ADMT 3.0 for Server 2003. 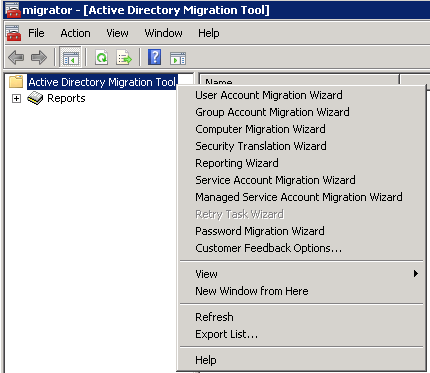 If you need to migration a Server 2000 Domain, you will need to use ADMT version 3.1 or earlier. Update Junes 2014 – ADMT 3.2 now supports Windows Server 2012 / 2012 R2. Run the ADMT setup file, and enter the named instance we created earlier. Here is the ADMT MMC, ready to go. This is by far the finest guide I’ve seen on ADMT. Thank you. Have you got one for cross forest mailbox moves from Exchange 2003 to Exchange 2010 forest? I can’t figure out what is wrong. Please help……..
1. The account with which you are installing ADMT and SQL should be added into local administrators specifically even it is a part of domain admin. 2. While providing the SQL Server details , use the name of server instead of . (dot) for local server, if your SQL Express is locally installed. The one in your link just takes you to the guide. Need to follow the steps below to gain access to download the tools. and you’ll see “Azure Active Directory Customer Connection” listed and can join. After joining you can download ADMT 3.2 and also the PES 3.2.